If someone used the events leading up to the Eberron setting's Last War as the inspiration for a Wuxia film, they might make a movie much like the one advertised in the Detective Dee trailer. 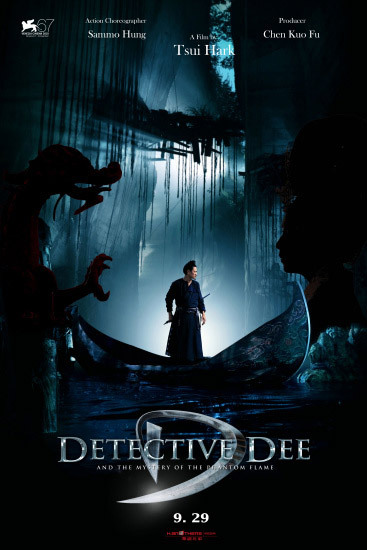 Detective Dee and the Phantom Flame is the most recent offering from director Tsui Hark. Tsui Hark was one of the pivotal directors of the 90s Hong Kong New Wave film scene. He brought the knowledge he learned at the University of Texas, Austin's film school to bring "Western" narrative and special effect techniques to Hong Kong films, and helped to create an all together new filmic style. His work on Swordsman and the Once Upon a Time in China series solidified his importance as a film director, though it was his earlier Zu Warriors from Magic Mountain that inspired John Carpenter's masterpiece Big Trouble in Little China. I have long admired Tsui Hark's films, though I do admit that his work with Jean Claude Van Damme made me worry that he had lost his touch. Knock Off was made in the days just prior to the return of Hong Kong to the People's Republic, and the film seemed to feature all of Tsui Hark's stylistic tricks. It was as if he was desperately trying to capture all of the magic of the HK movement in one film, and it left me baffled. It was trying to be too stylistic and too cool. My fears were quickly eliminated with the releases Time and Tide and Legend of Zu. In Legend, Tsui Hark demonstrated that he was still capable of innovation within the high fantasy Wuxia genre -- demonstrating his skill at incorporating computer generated special effects. I am eager to see what Detective Dee has to offer. Having Sammo Hung as action choreographer is particularly exciting. His recent work on films like Ip Man and Kill Zone is truly remarkable. I have long said that Swordsman II was the "most D&D" film of all time. The action is spectacular and over the top in a way that American films lack, but that players of role playing games hope for. I guess one could argue that D&D 4e is the "most Wuxia" game ever made, but it would have some good competition.